Made with leftovers from a recent quilt. In February I received the call that every mother wants to get from her college-aged daughter: "Mom, there are reports of a shooter on campus. We're in lockdown." I'll start at the end: no one was injured and they never confirmed the reports of a shooter. You can breathe now. So, that was a Tuesday. On Wednesday, my full-time job was to not drive to Buffalo to pick up my daughter with a "Well, we've tried this college thing and it just didn't work out. I'm moving you home now." I knew that wasn't the right thing to do even though it was the only impulse in this mother's heart. To pass the time and keep me from getting in my car and driving west, I grabbed a layer cake and designed and pieced a quilt. It's called Sweet Dreams and is available in three sizes (crib, twin, queen/king). I used the Boutique line from Chez Moi for Moda Fabrics. Yummy! ... to Laura Ingalls. I was without power for a week, had it back for 11 days, and it's gone again. I'm learning to cook on the woodstove, hand wash laundry, and hand sew by candle light. Lest you worry about me too much, the generator does run the computer and sewing machine. A girl's got to have her priorities straight. It's been 40 days -- 40 whole days that I've been home. I travel a lot for my job, but I've had 40 consecutive nights of sleeping in my own home. Since all things must end, in 6 more days it will be time to hit the road again. To tell the truth, I'm really looking forward to it. And that's just what I picked up today!!! I think I can convince a family member to carry this all into the house for me, but then it's up to me to make kits for my upcoming quilt shows. This should be enough to get me through the AQS show in Lancaster, PA and some of MQX in Providence, RI. I'll restock again in April -- my car is only so big! I have so, so much more to do though. I'm making my lists and checking them twice, hoping to give my students the very best -- they deserve it! I'll stop in and update my blog when time and internet access allow. In case I can't find any WiFi, I've left a few surprises for you on my blog that will show up just so you don't forget me while I'm gone. I've apparently lost my mind and I cannot find it. 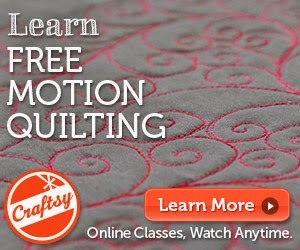 I signed up for the ps i quilt pinwheel sampler quilt along. I need to start a new project like I need more snow but I went ahead and did it anyway. It was so cute; my power to resist dissolved. Did I mention that I'm making this quilt entirely from scraps and stash? Wouldn't that make starting a new quilt a virtue rather than a vice? I spent my son's early years tripping over picking up action figures and listening to all of the little noises he made when he made his "guys" fight a battle. We had the typical superheroes.... Superman, Batman, Spiderman. We had every single Teenage Mutant Ninja Turtle ever made, and duplicates of several. My son also went through a He-Man phase. He had a wonderful sense of balance; he had a "good guy" toy in one hand and a "bad guy" toy in the other at all times. When he was three, we visited my sister for Thanksgiving. My son was in his grandfather's car playing with He-Man and Skeletor. The car hit a huge pothole and Skeletor went into my son's eye. He fussed as a 3-year-old would but soon calmed down. When we got to my sister's house in the evening and turned on the lights we realized what had actually happened: Skeletor had scratched my son's cornea. We found a nearby emergency room. My son was treated and given an antibiotic and an eye patch. We were told to take him to our eye doctor when we returned home. We had only lived in our town a short while and had not yet found an eye doctor. I knew that there was an eye doctor next door to the post office and decided to check him out. This doctor was wonderful! He told us everything would be fine (this was our only child at the time and we were typical overwrought parents) and teased Kevin about how the "bad guy" had hurt him. The doctor then teased us about how life-altering it may have been for our son to have been injured by a "good guy"! My son recovered quickly and probably doesn't even remember this incident. I'll find out the answer to that soon, though, since he reads my blog. We're grateful that this ended well, and we're grateful to have found a wonderful eye doctor. He's been our doctor for 20 years and our friend for nearly as long. This doctor annoys me, though. He shines bright lights in my eyes, blows air into my eyes, and asks me hard questions. The hardest questions he asks are these: "Which looks better? One? or Two? ..... One?...... or Two?" I usually make something up because I can rarely see a difference. I'm going to ask you, dear readers, the same question. Which looks better? I'm going to make all of the sashing out of 9-patches and the applique blocks will be featured in between. I bought two yards of super-bright pinky/purple from the $5 sale rack and two $1-fat quarters. I didn't buy these for specific projects; they will just be added to my bright collection. I'm in the process of making several bright scrap quilts and the box of brights is emptying. Running out of brights is something to be feared, now isn't it? 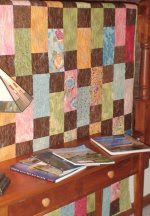 Friday finish -- Gretchen's quilt? I made a shop sample last fall using Birdie fabrics from Moda and Nesting pattern from Me and My Sister Designs. Birdie is likely the happiest fabric I've ever seen. My daughter-in-love adores this quilt and I want to give it to her. Her husband (my son..... a man!) says she already has a million quilts (um, that would be two) and doesn't need more. I don't want to cause marital dis-harmony, but the quilt is really cute and I really want my daughter-in-love to have this quilt. I left the finished quilt folded on her kitchen table (in my house ... we live together). My thought was "if she takes it, it's not quite the same as my giving it to her." So, the quilt disappeared into their living room and my hands are clean. When I asked my son if he noticed the new quilt in their living room, he just smiled. Happy quilts = happy wives = happy husbands? Late, again. But I have a really, really good excuse. Remember this from Thursday? Well, that 3-6 inches of snow was nearly 3 feet of snow. Trees and power lines were down everywhere. They opened my road on Saturday afternoon, but only to bring in an ambulance for a neighbor. More trees came down and the road closed again until Sunday. The power finally came back on Monday night. God bless whoever invented the woodstove, the generator, and the camp shower. We survived, but I like "on the grid" much better than "off the grid". The pinwheel blocks are from p.s. i quilt's pinwheel sampler quilt along. Cute, right?